Resilience, five years on – what have we achieved? Our Resilience Manager, Anna Francis just celebrated her five-year anniversary with Frome Town Council. Here she takes a look back at just some of the work that has taken place in that time and what it has meant for our town. In 2016 we worked with Climate Works to explore why we should go zero carbon and produced two papers looking at the benefits and how we could achieve this – here. We set a target of 2046 and the ex-president of the Maldives (Islands which will be submerged due to climate change) attended our launch. In March 2016 we held a ‘Switch to a Renewable Future’ series of events, as part of our twinning programme, attended by over 600 people. Following the International Panel on Climate Change’s study which shows we have less than 12 years to move away from fossil fuels, Frome Town Council declared a climate emergency in December 2018 and changed the date to become carbon neutral by 2030. As part of this we signed up to the global Covenant of Mayors. We have shared our paper, zero carbon calculator, Covenant declaration and other useful documents with councils around the country who have also now declared emergencies – this includes Mendip and Somerset. We have continued to engage with the local community through a range of excellent climate change events – including 12 monthly talks from energy expert Nikki Jones, Dr Aaron Thierry and Roger Hallam. We have started developing a climate risk action plan in partnership with Trios outlining how we can work with the community and other partners to help reduce the impacts of climate change. We put 14kw of solar on the Cheese and Grain in 2013 and helped support Frome Renewable Energy Co-op who raised £280,000 in three days in 2015 to put 150kw of solar on Frome Medical Practice and 50kw of solar on Frome Football Club. FRECo used its community fund upfront to help support building the new solar stand and FTC raised £30,000 from Mendip’s Local Legacy Fund to co-finance the new stand. We won most proactive public sector body in the South West for work in this area at the end of 2014. We helped Harry’s Hydro get £12,000 of solar panels through the M&S Community Solar Fund. We enabled Christchurch School to have 21kw of free solar via Green Nation in March 2019. We have also encouraged businesses such as Storagebase to install solar panels. We worked with local installer Iddea to offer local homes a discounted solar scheme. 55 people came to the launch in March 2019, more is due to happen in the next few months. 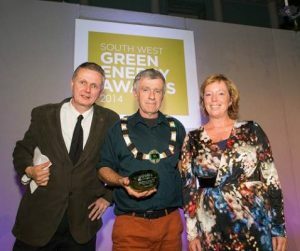 Other events to empower the community to cut carbon and costs have included: Frome Open Homes – attended by over 600 people, 98% of whom said they were inspired to take action in their own homes; One Planet Sunday which we ran for two years, attended by 700 people and in 2018 Improve Don’t Move which showcased local suppliers, architects and tradespeople that offer green services. We have also reached out to other councils around the South West. This has included two Zero Carbon Town events which included a presentation by the Centre for Alternative Technology. We also showcased our resilience work at the annual meetings of National Association of Local Councils and the Society of Council Clerks. We have held regular fuel poverty events every winter at both the Medical Practice and Town Hall. We have held training sessions for local energy volunteers and GPs and linked in with CSE’s Warm and Improved Somerset Homes programme. We have a thermal imaging camera that people can borrow for a small donation to SHARE to pinpoint places their homes are leaking heat. We have promoted insulation offers including a free one in summer 2018 which was taken up by over 60 households. We have linked local schools into Energy Sparks website which enables them to see real-time information about their energy use and to conduct a range of curriculum linked activities to cut costs and carbon. We continue to lobby and work with others to encourage Somerset County Council’s Pension Fund, which invests £174m in fossil fuels, to switch to cleaner investments. We are linking with CPRO’s Microgrid Foundry to explore setting up a microgrid at Saxonvale. This would maximise on site solar generation and use and could be community owned in partnership with FRECo. In 2018 we developed a transport strategy and are working to achieve and lobby for the changes we want to see. 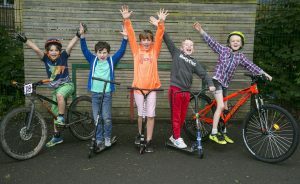 We have worked with Frome’s Missing Link to support and then run the Active Travel Challenge in local schools the last two years, this saw over 2,000 pupils participate and active travel increase by 20%. This year’s Active Travel Challenge will be taking place 20-24th May. A short film is available here. In 2017 we bought two electric bikes which are available for hire on-line, for pick up at Cycology. This is now well used and the scheme has broken even. In 2014 we secured funding from the Department for Transport to set up a car club. Co-Wheels continue to offer two hybrid vehicles for affordable hire around the town. Typically one car club vehicle displaces around ten privately owned vehicles. Hybrids are also lower emission than many other vehicles. We secured free electric charge points via Zero Carbon World with two at the Cheese and Grain, one at Frome Football Club, one at Frome Town Hall and an upgrade to one at Frome Medical Practice. We are now working with Raw Charging to provide more charge points throughout the town. Electric vehicles generate 2/3 less emissions than petrol or diesel vehicles (and are zero carbon in use when they use green energy). With cuts to bus services in local villages and the closure of Locks Hill Surgery more and more people were not able to access medical appointments or other services. 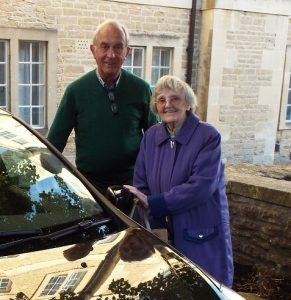 In 2016 we set up Frome Community Cars – a volunteer driver scheme. The programme is now run by Sustainable Frome and has over 150 members. 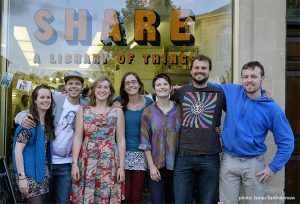 In 2015 we set up the UK’s first ‘library of things’ in partnership with Edventure. The shop now has 1000 members and enables at least 12 tonnes of waste to be diverted from landfill every year. The project also runs monthly repair cafes which diverts more waste and connects community. Both projects featured on Countryfile in 2019 and have inspired others around the country to set up similar projects. We also helped to secure funding to enable SHARE to run monthly repair cafes and diverted over 10 tonnes of electrical waste per year. In 2016 we set up the UK’s first community fridge. The fridge now diverts around 7000 items of food from landfill each month and is supported by an amazing team of volunteers. In 2018 we expanded the fridge to include a community larder. There are now almost 50 other community fridges in the UK. We co-hosted several screenings of a Plastic Ocean and facilitated community meetings on the theme. We then helped develop a plastic free website and leaflet outlining local ways to reduce plastic. 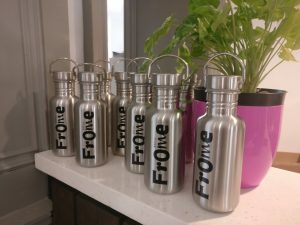 We also bought metal water bottles that we sell at reception. In September 2018 we had an award-winning plastic free float in Frome Carnival. We are working with local businesses and others to secure our single use ‘plastic free town’ status. We have helped support and fundraise for waste cutting projects such as Frome’s Happy Nappy Library (which is now part of SHARE) and Frome’s Toy Library. Anna helped secure £20,000 for Fair Frome’s furniture scheme to repair and divert electrical items in 2018. At the Youth Conference in 2018 we got students to design new recycling bins for Victoria Park which will be installed soon. Over the past few years we have conducted ‘Good Business’ visits with over 30 local organisations, exploring ways to link more closely to support the local community and to enhance their environmental performance. We have also held regular green themed business breakfasts exploring waste, energy and transport. We have helped secure over £170,000 of external grants to support resilience activities in Frome – either directly through projects or through organisations such as the Toy Library, Happy Nappy Library, Edventure, Fair Frome, Sustainable Frome, Co-Wheels, Frome Football Club and Harry’s Hydro. I co-led the campaign to save Whatcombe fields, which raised £330,000 through community shares in 2015 and secured 33 acres of land for community use. In fact, through resilience and community projects and Freco, in the last five years we’ve helped to raise over £900,000. As well as talks, workshops and visits with a wide range of councils and organisations, our resilience projects have featured in The Guardian, Countryfile, Jamie and Jimmy’s Food Feast, Russia Today TV, Metro, Evening Standard and BBC South West. It’s a busy few years I am sure you’ll agree. Let’s see what we can achieve in the next five.